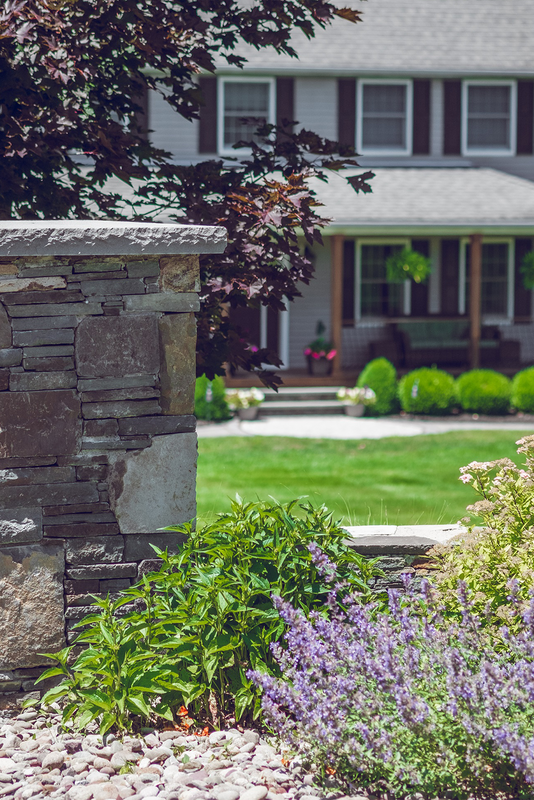 Our design team reimagined an expansive Warwick backyard to include the supportive structure of stone retaining walls, patio and hand-laid stone steps. 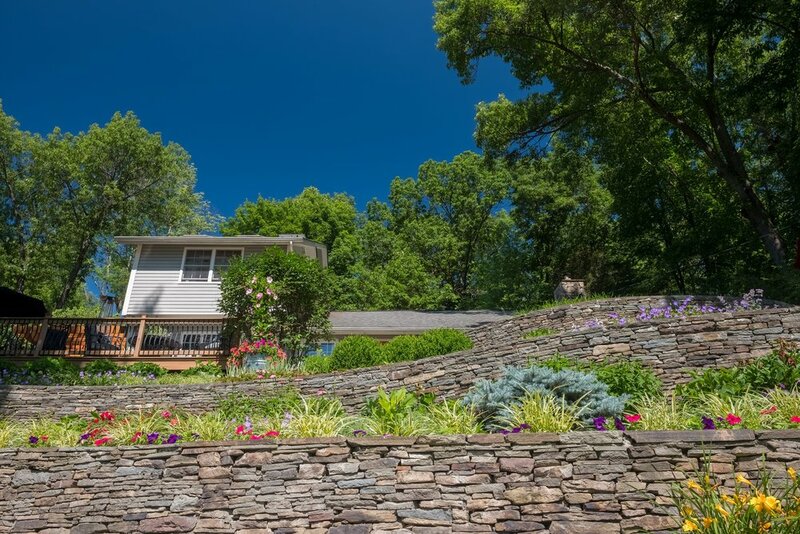 From doorway to the property edge, an intricately designed retaining wall encompasses changing elevation from home to yard. 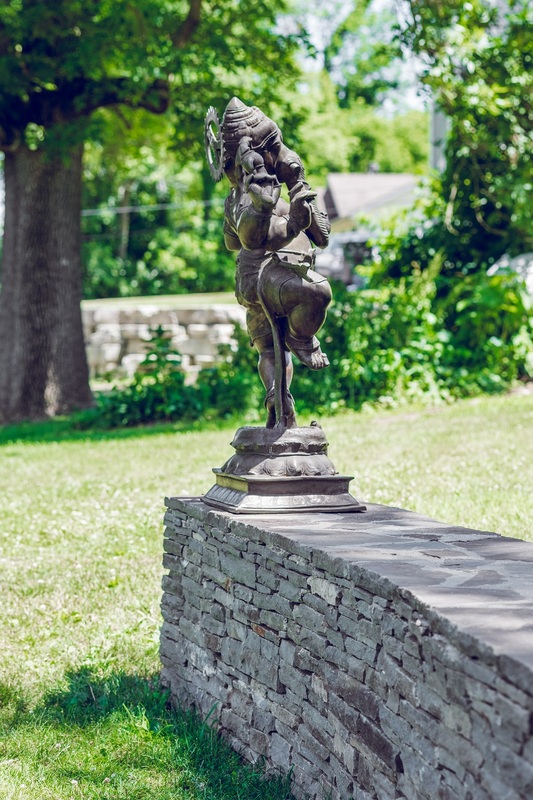 Its two arms reach beyond the patio and down into the landscape, leading the eye throughout the property. 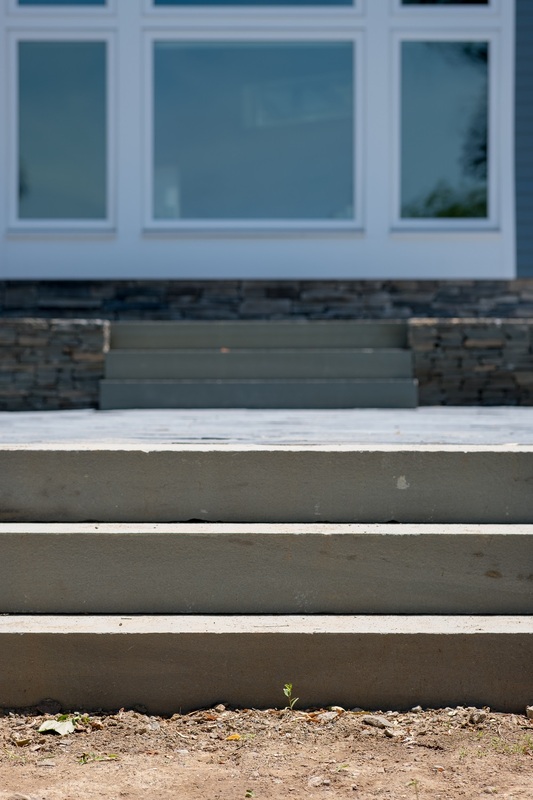 Beneath the new stone stairway, pavers spread across a spacious patio for lounging and dining while looking out over the verdant yard. 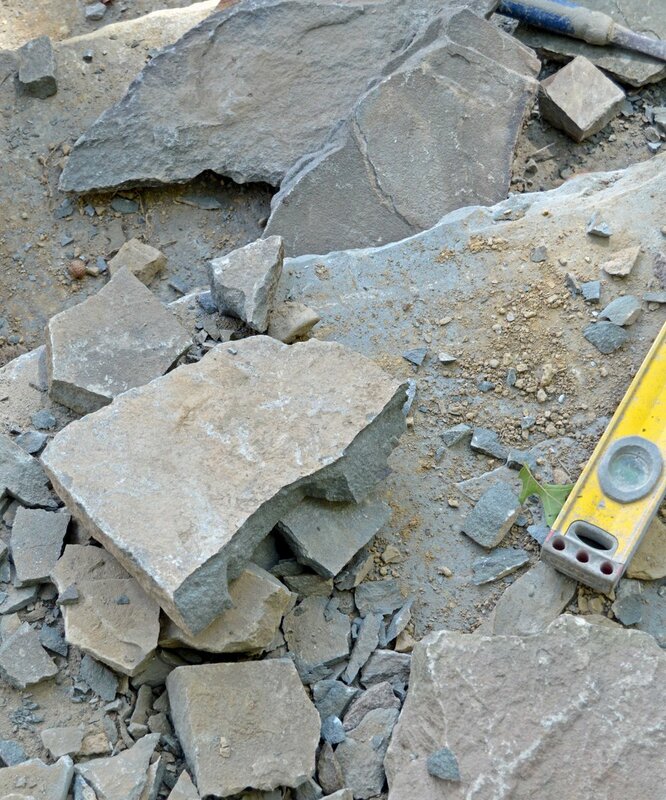 The mix of natural stone and pavers create both a practically stable and aesthetically balanced hardscape to balance with the immense outdoor space. 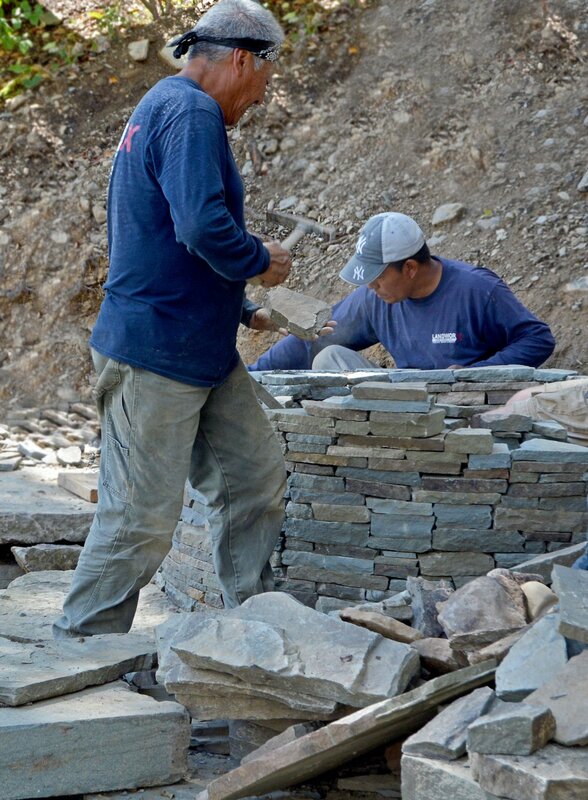 Our Landscape Craftsmen at work. 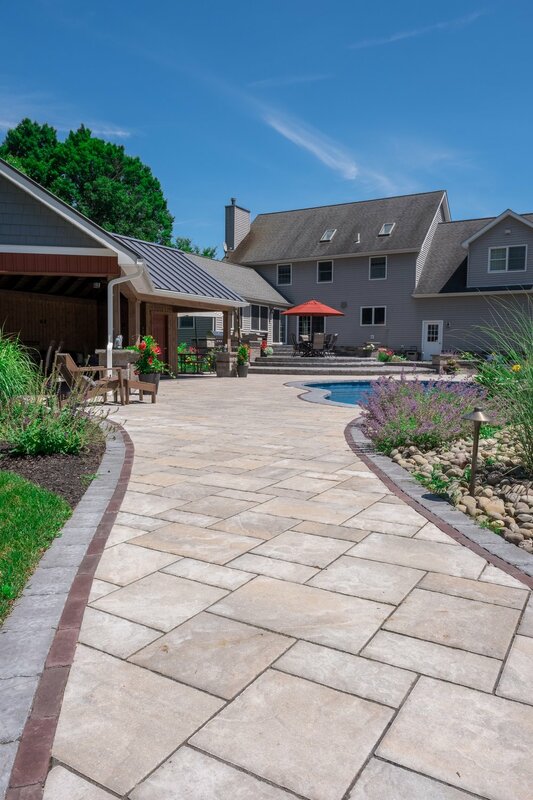 Naturally harmonizing with the sweeping curve of this Warwick, New York landscape, large format slabs of bluestone lead to a natural stone backyard patio. 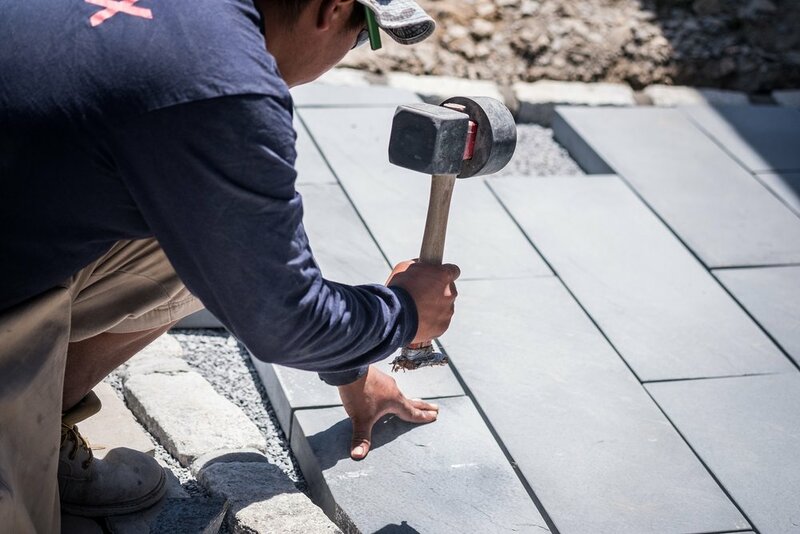 By using bluestone slabs of identical sizes, the walkway takes on a clean, modern appearance while melding with the natural hues and textures of the surrounding garden, yard and home's classic architecture. 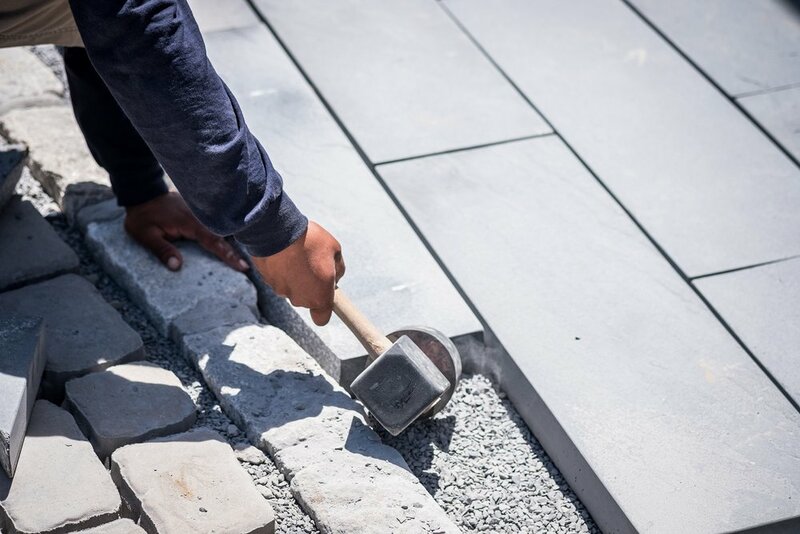 Even with their uniform cut, every piece of bluestone features a one-of-a-kind texture and color to catch the eye as each visitor travels around the home. 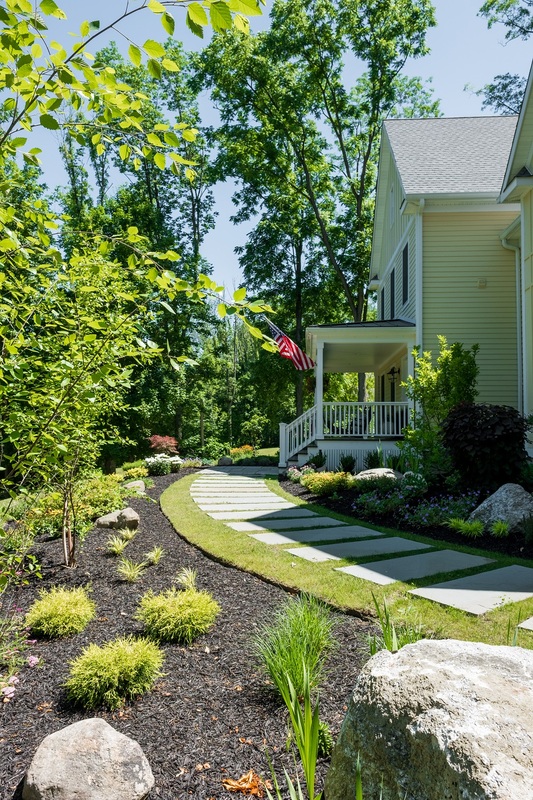 The walkway curves around from the front entranceway to the backyard seating area, culminating at a natural stone patio with surrounding retaining walls and lush garden. 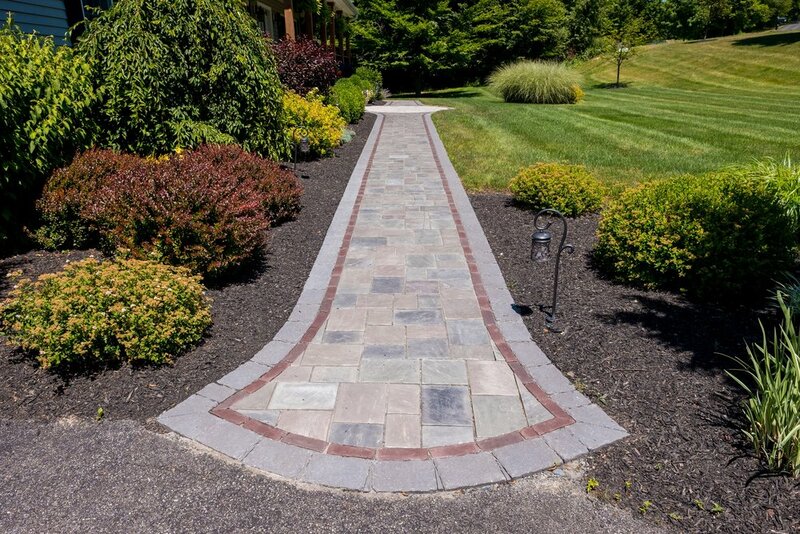 By utilizing the innate beauty of Pennsylvania Bluestone and natural fieldstone, Landworx designers and installation craftsmen married a flowing walkway, softly curving retaining wall and expansive patio in this zen-like Goshen, NY landscape. After taking in the artfully tiered stone-stacked garden walls, guests emerge before the outdoor fireplace, the centerpiece of the backyard patio. 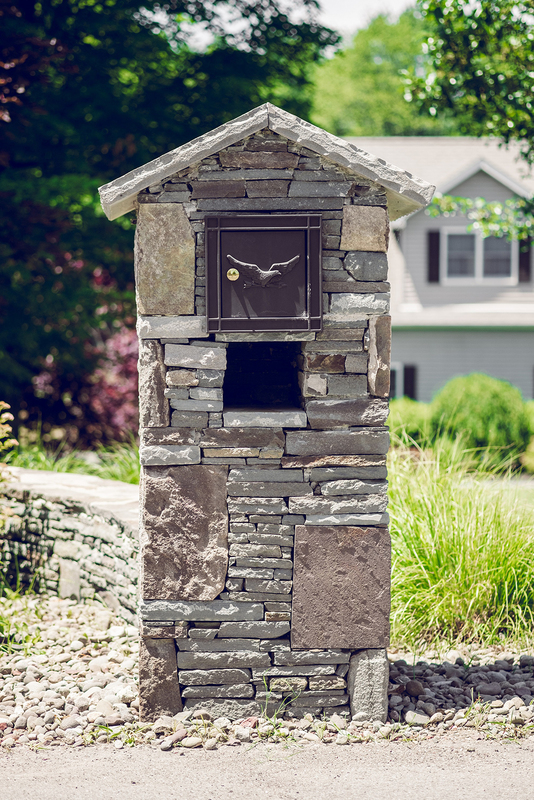 Custom-stacked with natural stone, this towering fireplace is a one-of-a-kind piece designed by the dedicated Landworx team. 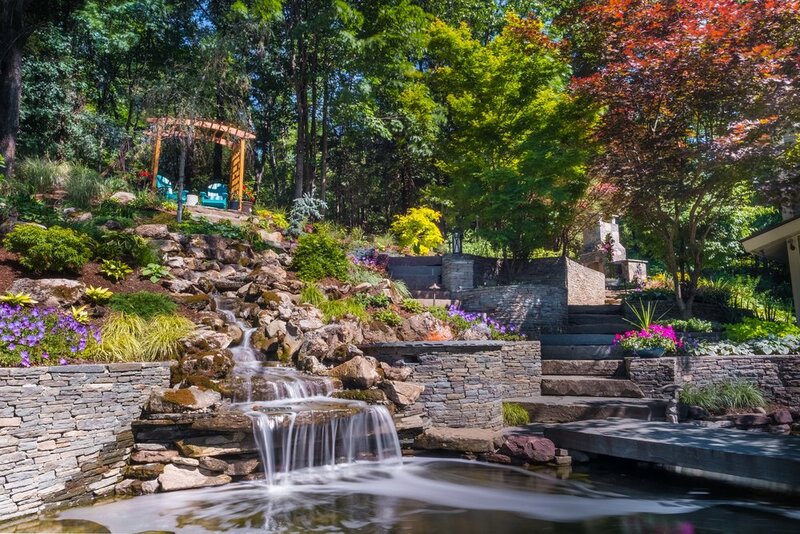 With flowing water fountains and layers of multi-colored plantings and foliage, this garden excites all the senses throughout the year. Flowing with ease from the raised dining area to the expansive fire pit lounge, natural bluestone step slabs guide guests through a rustic-yet-chic garden and backyard haven. 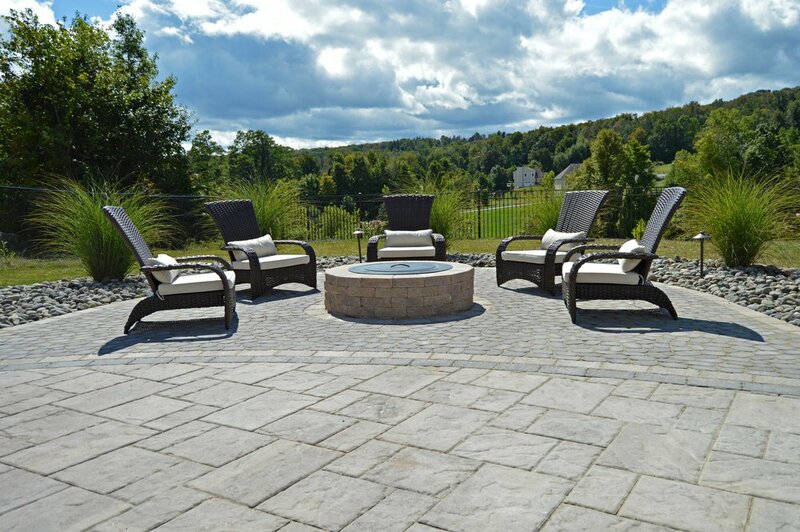 Designers at Landworx in Goshen, NY chose the Unilock Brussels Dimensional System wall, which creates seamless curved separation from the rolling hills and fire pit gathering space. 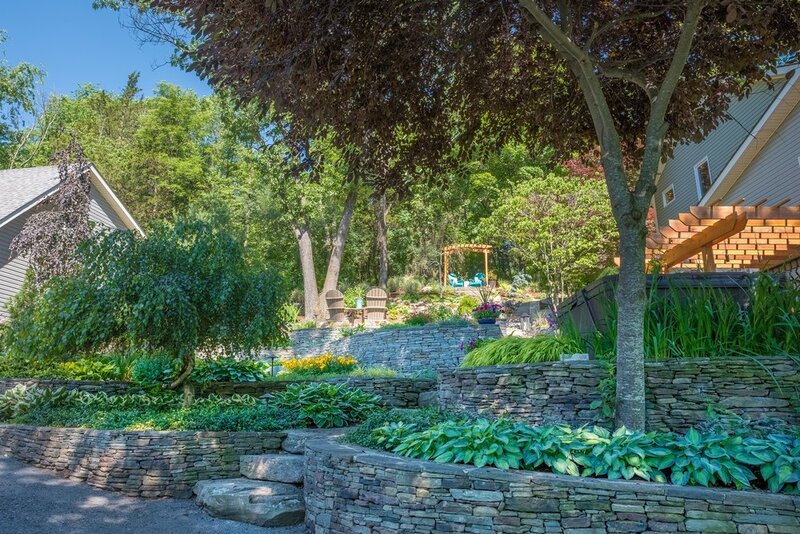 When family and guests explore this personality-filled backyard spot, they flow from the dining and grilling area, down the natural stone steps and finally out into the communal fire pit patio area that highlights the surrounding garden and sprawling yards. 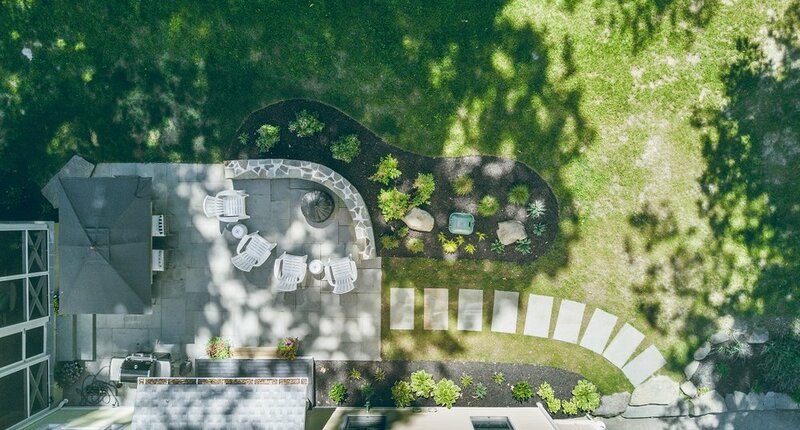 When a landscape provides endless, extensive views as in this Montgomery, NY backyard, artful and minimalist layout allows the land to speak for itself. 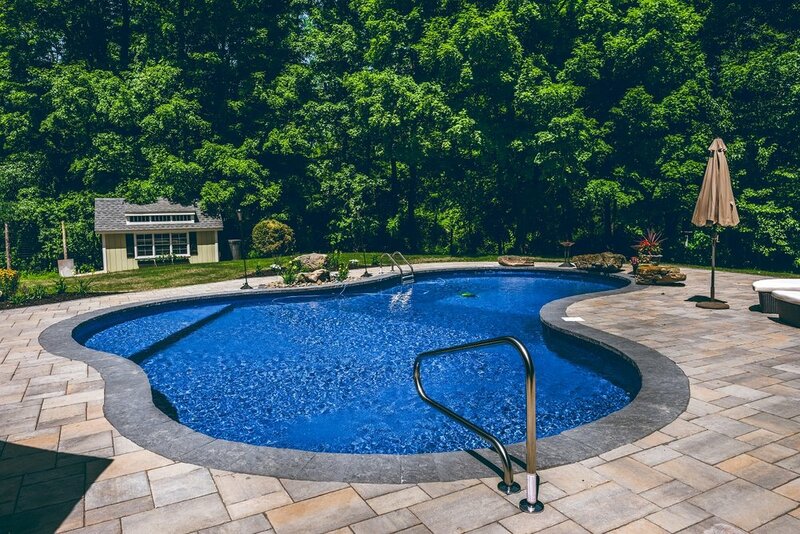 Elegantly surrounded by Techo Bloc Blu 60 Smooth pavers and Natural Bluestone coping, this symmetrical poolscape combines beauty with space and comfort. 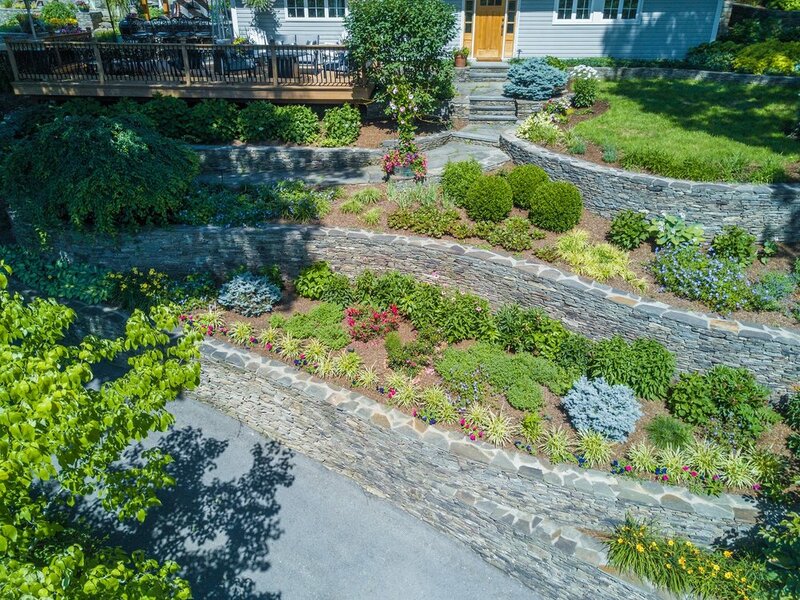 Natural fieldstone walls raise the yard toward the custom natural stone fire pit, which overlooks rolling mountains and surrounding foliage throughout the year. Structured and chic, this poolscape, dining area, and fire pit welcome large gatherings of guests to enjoy the surrounding beauty year round. 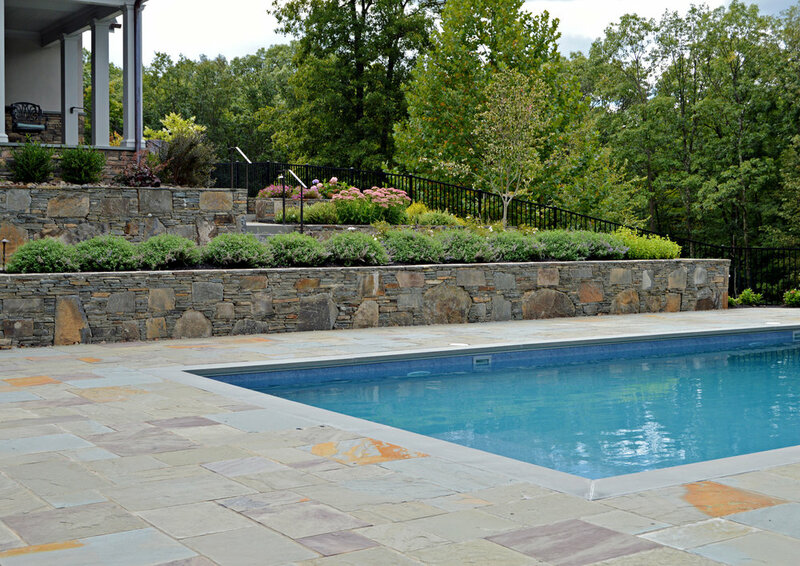 Inspired by the rich, multi-tonal views of the property, Landworx incorporated naturally beautiful Pennsylvania Bluestone throughout this expansive poolside and tiered patio. With geometric simplicity, this cleanly laid rectangular pool mirrors the modern elegance of the home, while taking advantage of the multi-tiered elevations offered by the backyard. 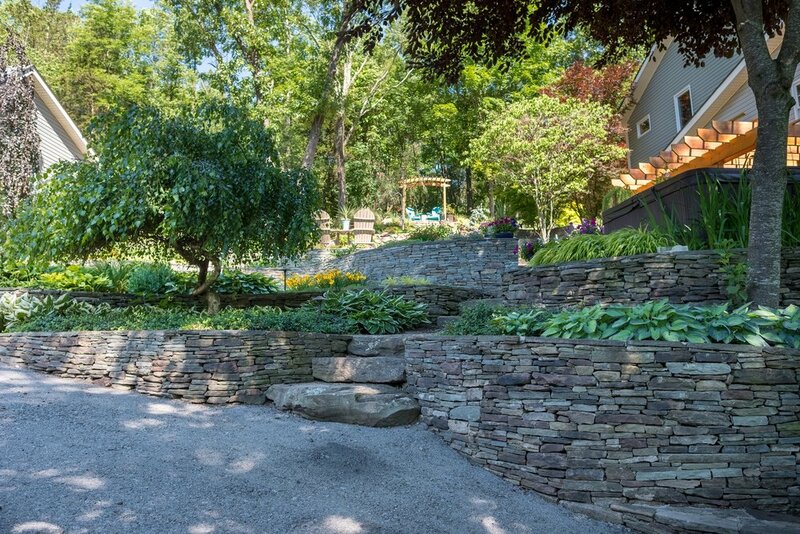 Tight-fitting natural stone retaining walls create a one-of-a-kind look to the multi-leveled garden design. Guests weave their way through the artfully designed flower beds and shrubbery before heading down to lounge on the warm stones by the poolside. 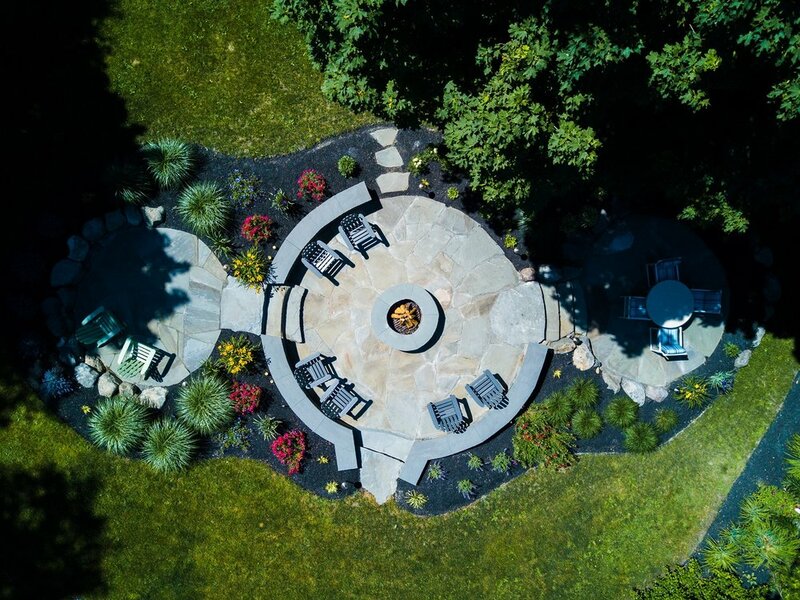 Seamlessly complementing the natural ebb and flow of the Pine Island, NY landscape, this sprawling poolside transformed an already expansive area into a respite from a busy week. 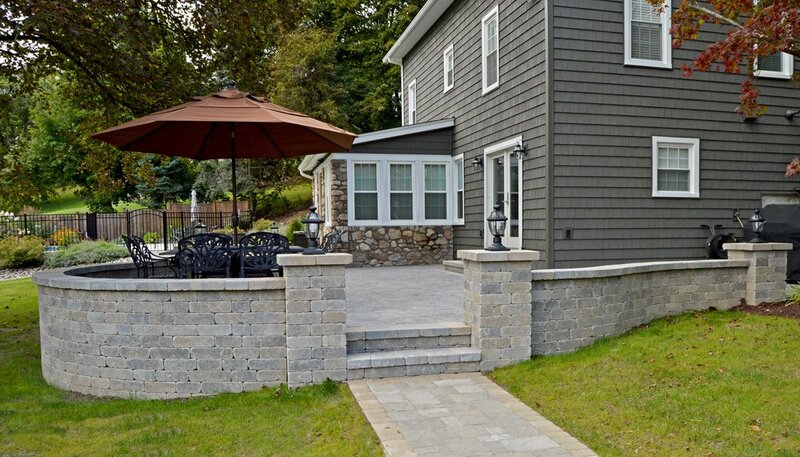 Elegant pavers from the Techo-Bloc's Blu 60 collection surround the poolside, lined with a delicate Hera 6x9 border. 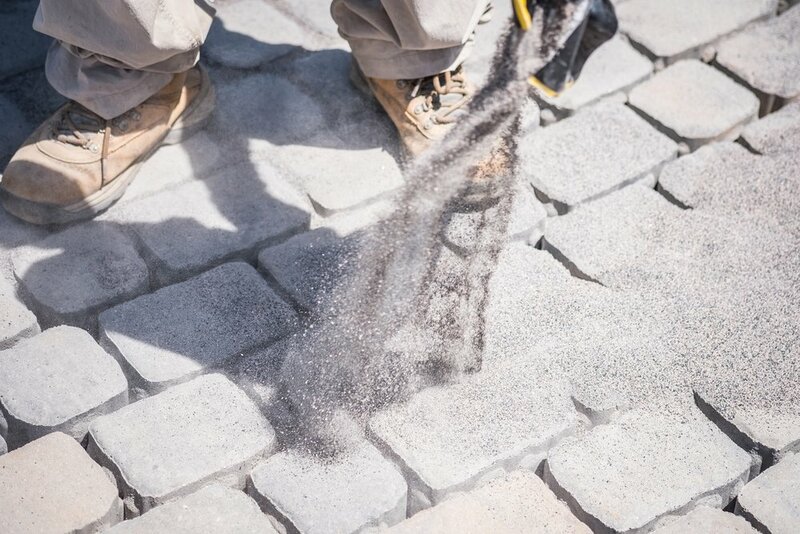 Their signature Antika cobblestone transitions into the fire pit lounge, backed by the flowing countryside and surrounding foliage. Framing the pool patio, sits a multi-tiered garden, showcasing the unique topography of the backyard space. 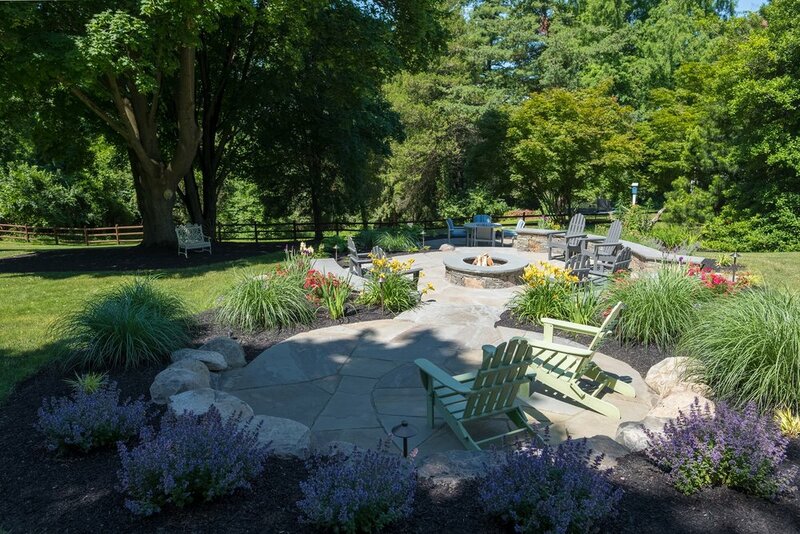 Whether lounging by the reflective pool or warming their feet by the fire pit, guests in this backyard can appreciate the stunning surrounding area while finding comfort in a well-designed poolscape. 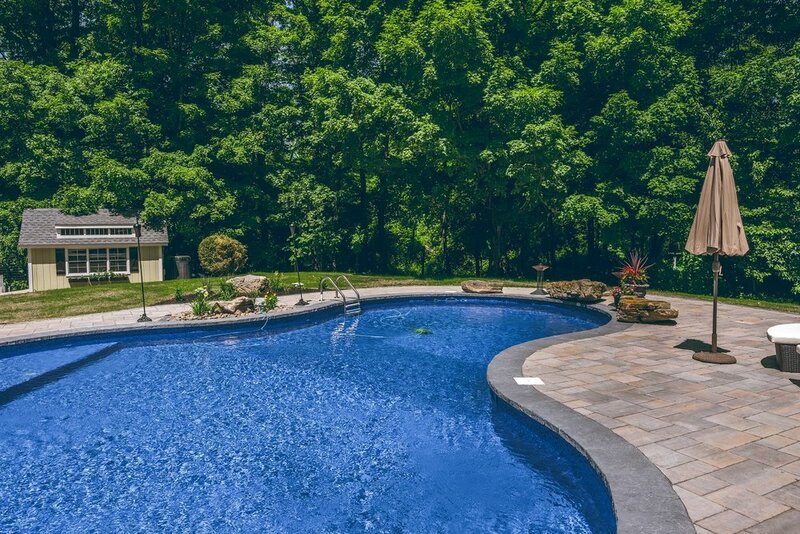 Surrounded on all sides by stunning, dense forest, this Goshen, NY area poolside transitions gracefully from landscape to patio. 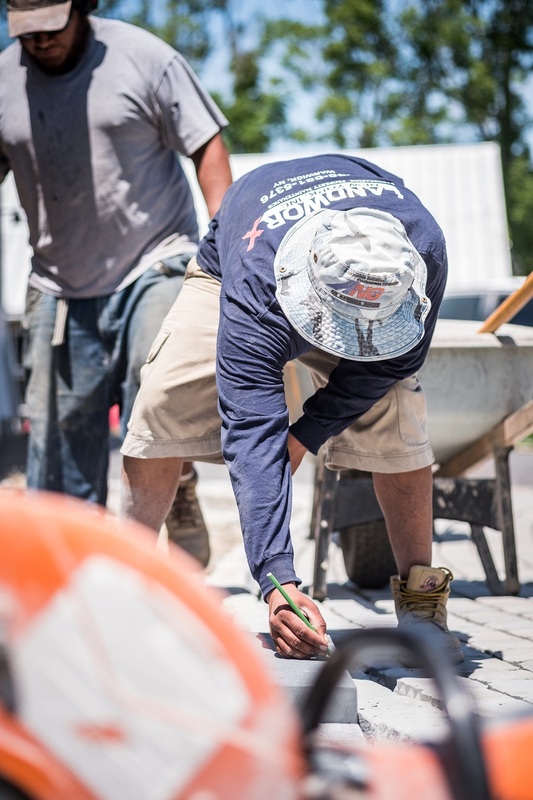 Landworx contractors utilized Techo Blu 60 stones with a Hera border throughout the winding patio and pool areas. 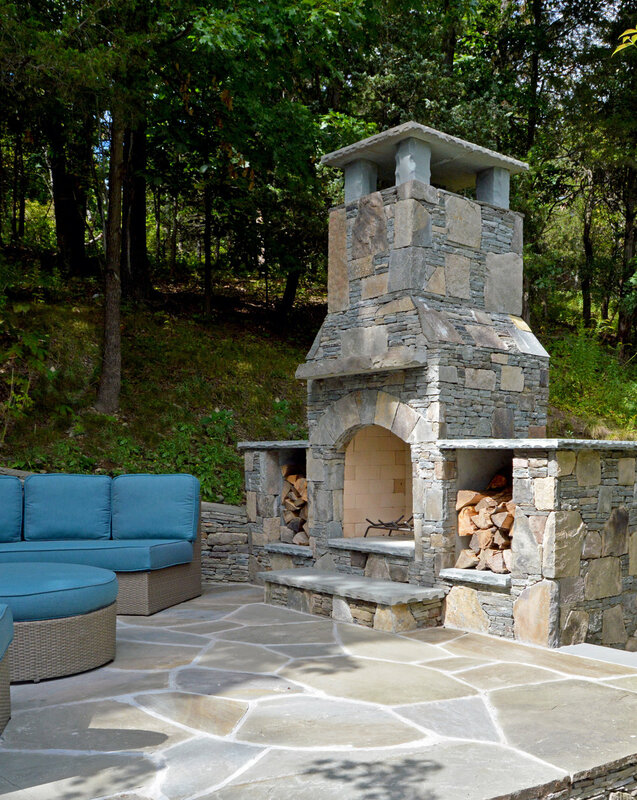 Elegant stone veneer surrounds the calming waterfall and welcoming fire pit as well. Patches of flowers and local grasses complement each curve and pocket surrounding the poolscape, making this an ideal place to dine, lounge and swim while appreciating the stunning natural surrounding of Orange Country throughout the summer and fall. 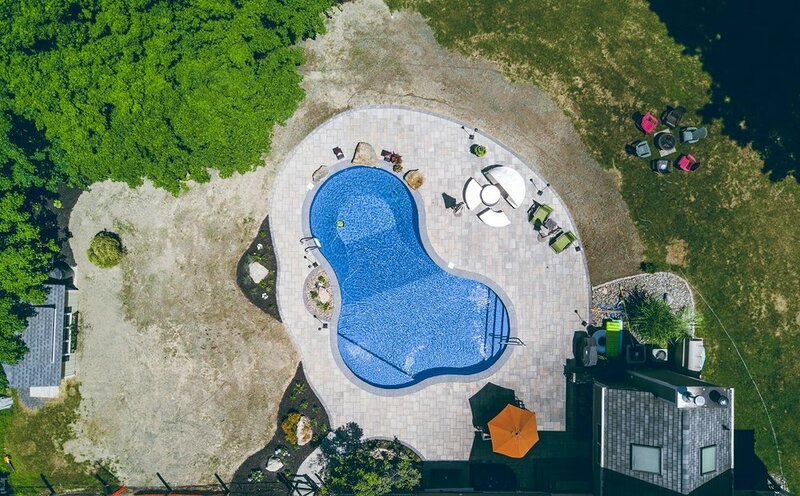 A backyard resort with endless hours of entertainment in Middletown, NY. This remarkable hosting sanctuary welcomes guests for long days in the sun by the pool and warm nights by the rustic, expansive outdoor bar and kitchen. 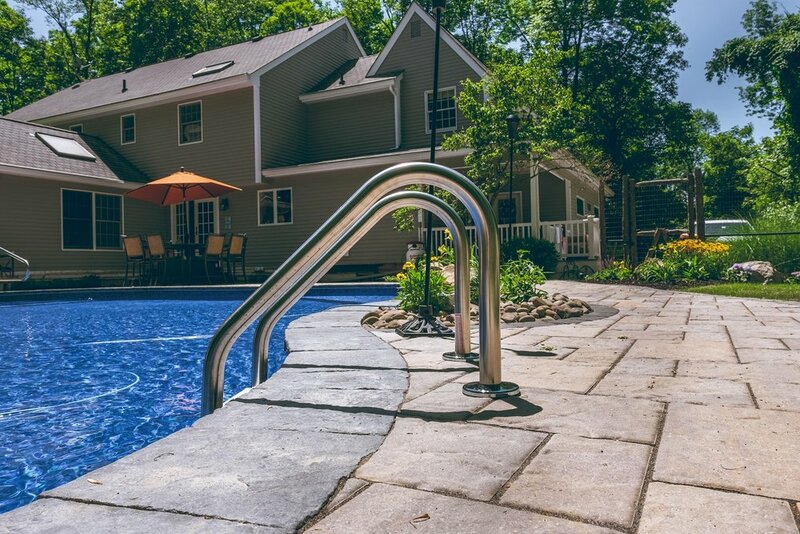 When guests enter this outdoor oasis, they can travel in and out of the water with ease using the bluestone beach entry, even lounging directly in the water if they choose to use the sun ledge. A curated collection of Unilock pavers and Bluestone work their way through the space, blending it with the rural surrounding property. For more excitement in the day, two waterslides weave through the natural rock structures, surrounded by rushing waterfalls and a one-of-a-kind stone diving rock. To complete the day's experience, this resort includes a full-service kitchen and bar just off the lounging and pool areas, providing everything a guest desires for a total escape from life's rhythm. An outdoor kitchen and in-ground pool sit perched on a secluded island. 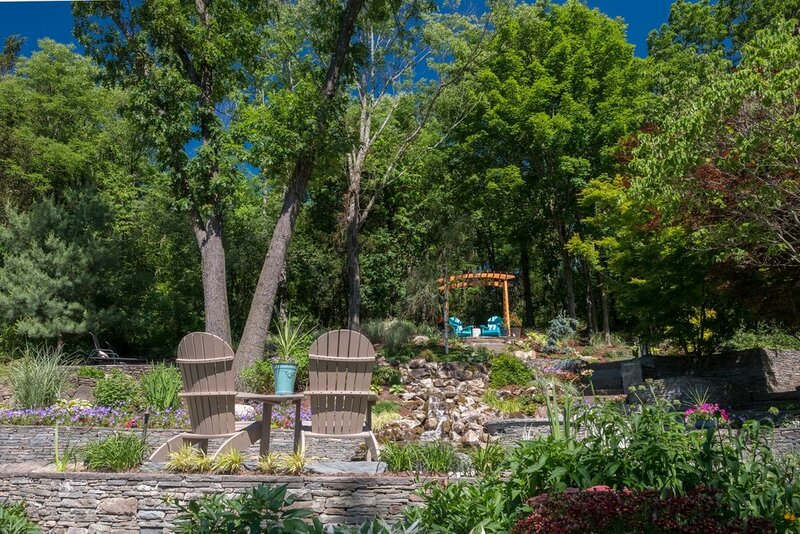 Encircled by the property's rich, rural views and accents, this natural poolscape serves as a respite for complete relaxation both in the heat of summer and on cool nights by the fire pit. 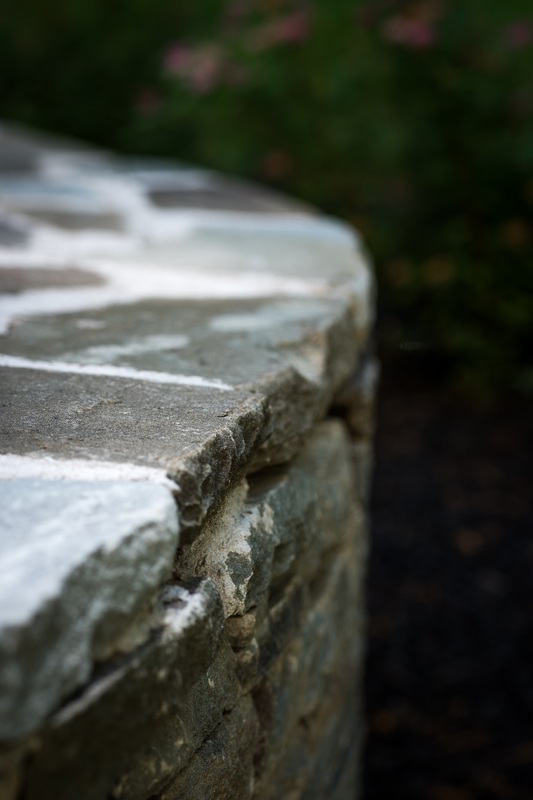 A combination of modern structure and hand-chosen natural stones create this one-of-a-kind patio, providing a work of art to be experienced by residents and guests alike. Set atop an island of smooth, distinctive stones, guests smoothly travel between the in-ground pool, full outdoor kitchen and dynamic lounging space that spreads throughout the property. At the end of the evening, a group can gather around the stone-stacked fire pit that looks out of the river that weaves its way into the distance. This unique design fully complements the beauty of its natural haven. 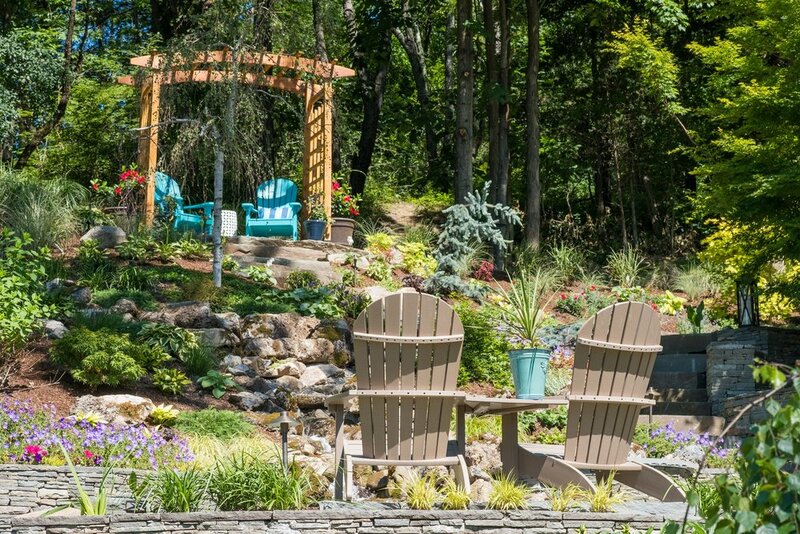 A lakeside oasis in Bethel, NY where beauty and relaxation await. 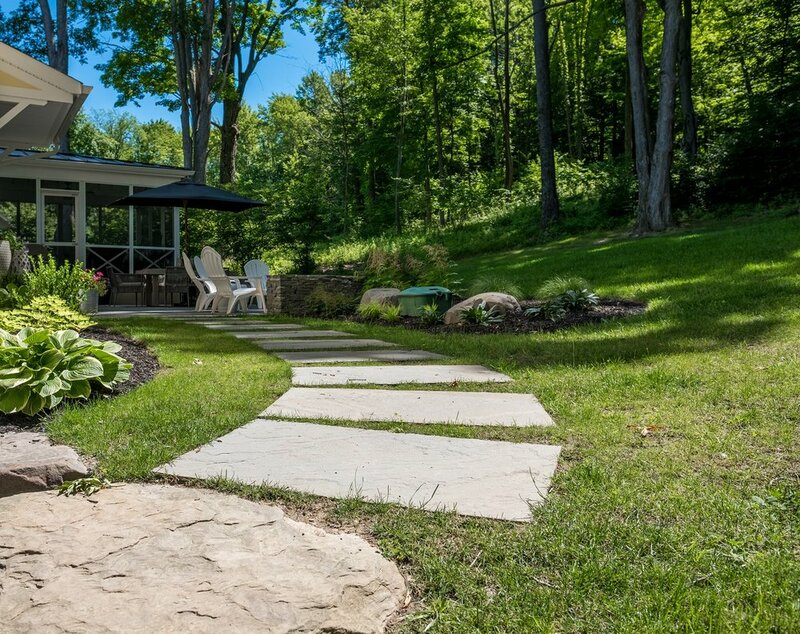 With the goal of further accentuating the breathtaking lakeside views on this Bethel, NY property, designers at Landworx seamlessly blended a complementary outdoor oasis with the property's stunning features. Unique, natural stone line the walkway and patio around the curved pool and hot tub, snuggly edging along the property's hillside. 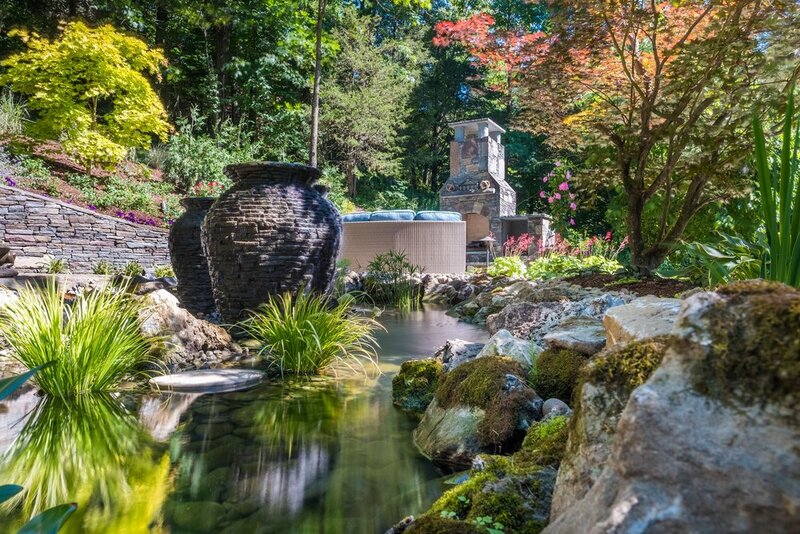 The poolscape is encircled by a natural boulder retaining wall, separating the structure of the lawn and welcoming guests to travel into the connecting paths of the property. 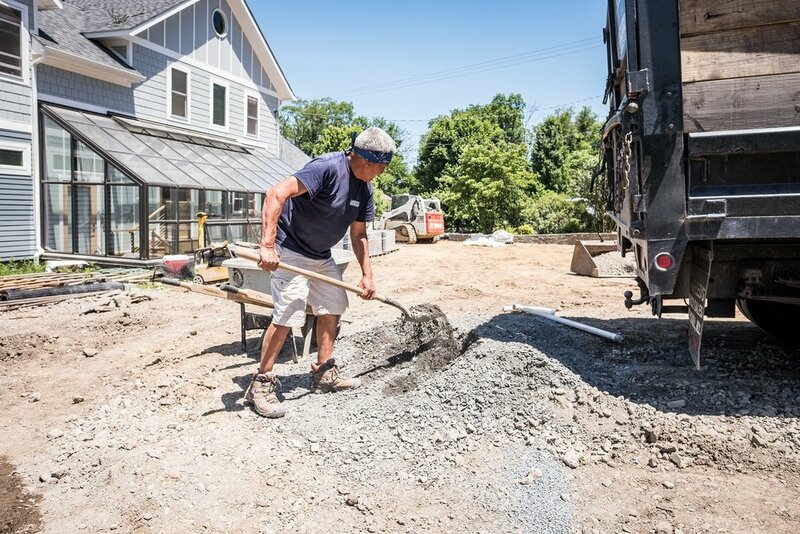 Additionally, the Landworx team chose an ideal spot for a stone fire pit, welcoming its visitors to gaze out over the expansive lake that surrounds the neighborhood.